A David Mitchell story made me go into labor. 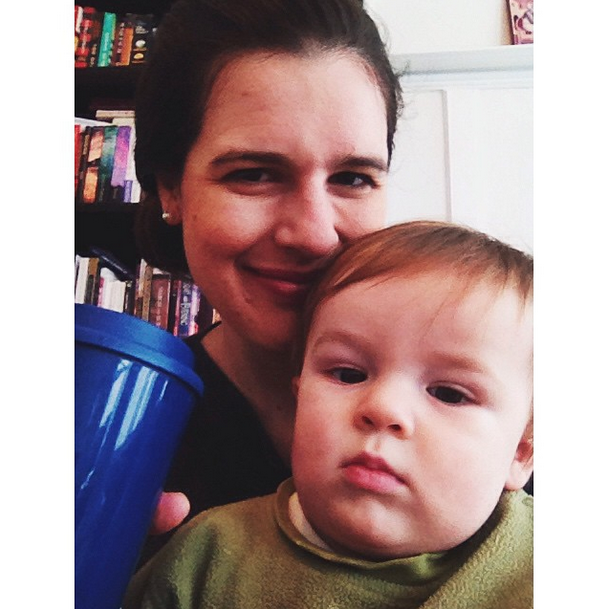 I was super overdue with Christopher – my mom had arrived the week before thinking surely baby would have come out by now – and we decided to Just Do It and had gone for a very long walk the day before. I was feeling very out of it and very over it the next day, so we made it a pizza and movie Friday. Having seen David Mitchell give a talk and a reading at Yale that week (one perk of being late), we were all in a Cloud Atlas mood and cued it up on HBOGo. I went into labor early the next morning. Post-modern narrative conceits can be powerful, apparently. Anyway, I’ve been a huge fan since his charming talk at Yale. I whizzed through Black Swan Green, Cloud Atlas, and The Thousand Autumns of Jacob de Zoet while nursing in the middle of the night and was first in line at the library for The Bone Clocks. Mitchell’s books are great because they can be read both for the stellar literary value and, increasingly with the last two novels, as genre fiction with a complex and interlocking world. He is absolutely my favorite contemporary author. It is becoming increasingly clear with each novel that the small allusions to characters or stories or even cats in his other works are not just Easter eggs to reward loyal readers; rather, his world is coalescing and pieces of his earlier novels that were mysterious are beginning to fit into a more coherent whole. 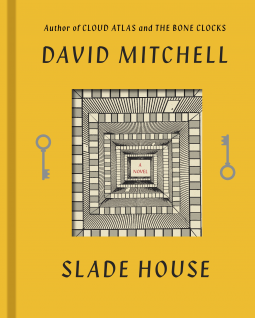 His latest, Slade House, is the most revealing of the bunch yet, setting up a battle between Good and Evil that expands our understanding of the Mitchell-verse even further, from eternal recurrence in Cloud Atlas to those creepy monks in Thousand Autumns. Slade House had its origins as a “Twitter novella” called “The Right Sort,” and the first chapter of the book is very familiar to those who caught that story. Our book is told from the point of view of six guests who are dragged or drawn to the titular house by a neurotic mother or by interest in the hints of the paranormal in tales of disappearances down Slade Alley. Ultimately, we find that the house indeed is hiding something very nefarious and not only lives, but souls, are in danger upon entering. I’m vague because I want to keep this review spoiler-free. The book is too fun to spoil for you. It is striking how slick and tight Slade House reads. This is not a criticism, but rather a refreshing change from The Bone Clocks, which, while enjoyable, suffered from some bloat (the Iraq chapter, anyone?). Its narrow focus (one place, two baddies) was refreshingly concise without sacrificing any of Mitchell’s characteristic wit or extraordinary ability to paint a scene. I sped through House, eating up each of the six chapters’ spooky atmosphere and just-disturbing-enough conclusions. The denouement will be satisfying for those coming to Mitchell’s works for the first time, but it is especially thrilling for fans of his whole mythology. In a way, this book is a companion to Bone Clocks, bringing clarity where BC, for better or worse, obscured its own battle between good and evil with extended character study. What I enjoy most about Mitchell is his meticulous understanding of his characters, but the weakest point was a chapter told from the point of view of a first year female college student; Mitchell doesn’t quite capture the teenage girl mindset (and didn’t in the first part of Bone Clocks either), but he has confessed his difficulty with writing female characters before. On the other hand, you really do believe you are peering into the other characters’ heads, from the boy in the thrift store jacket in the first chapter to a journalist seeking the truth about her sister’s disappearance. The details of their respective time periods and particular quirks are illuminating to their world. Slade House reads like genre fiction, but it also provides opportunity for deeper meditation on what it means to seek immortality, so to speak, on the backs of others. The themes in last battle reminded me a lot of Ursula K. Le Guin’s “Those Who Walk Away from Omelas“. The book is a thrilling and spooky read, rewarding both for Mitchell fans and those seeking an engrossing story. I was provided with an advance review copy of Slade House by Random House in exchange for an honest review.